Observation of Intermolecular Reaction, Excimer Generation etc. Transient Absorption Spectroscopy (TAS) is a high-speed time resolved absorption measurement. A pulsed light (pump light) excites the target material. 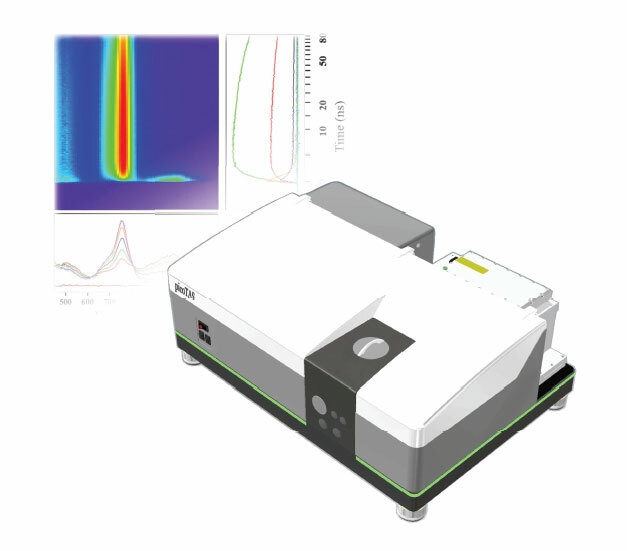 The subsequent processes are observed by time resolved spectroscopic analysis. In contrast to fluorescence spectroscopy, TAS can explore non-fluorescent reactions over a wide time regime such as short-lived radical species, intermediate and charge transfer states. picoTAS has some distinct advantages over conventional transient absorption techniques. Other than the “Pump & Probe” method or the “Nanosecond Flash Photolysis” method, picoTAS can measure from the pico second regime to milli seconds. And it can detect fluorescent and non-fluorescent intermediates. picoTAS has an ingenious way to remove overlaying luminescence signal and can obtain an accurate transient absorption (TA) signal of i.e. excited singlet and triplet states.